Last weekend, two of your correspondents had a night out with their significant others and a few old school mates at Cala Luna – a restaurant in the Middle Harbour Yacht Club on the Spit. illiards and I weren’t expecting anything special from the beer list, but were pleasantly surprised to the see two @Untappd uniques for Back of the Ferry. In line with the influence on the cuisine, the two beers were Italian. 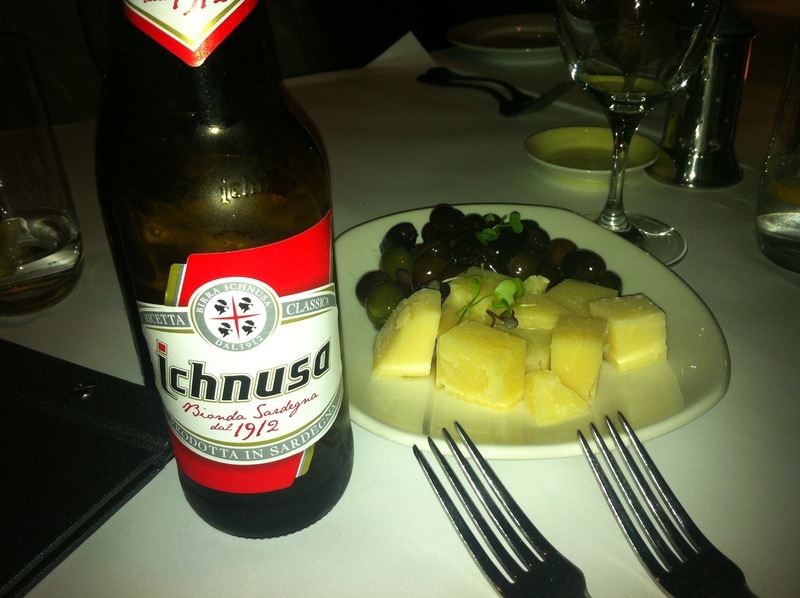 Ichnusa comes from the island of Sardinia, which used to be called Ichnusa by the Ancient Greeks. It’s a brewery that is now owned by Heineken, and to be honest what was in the bottle could have been Heineken – a very nondescript Euro lager. 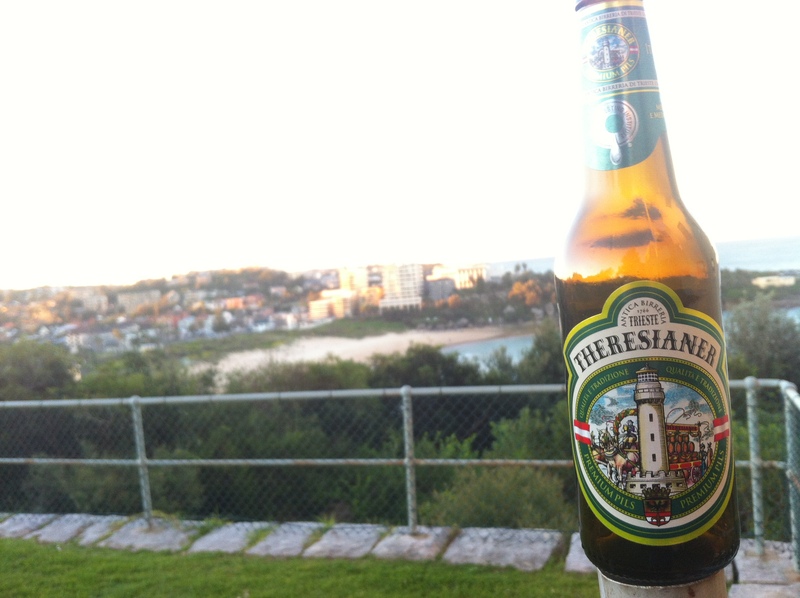 I was not as underwhelmed by the next offering – a Premium Pils an offering by a brewer from Trieste, Italy named Theresianer. A couple of the lads raved about this one, but I found it a little thin and the hops not very apparent. Still – not unpotable. The label is an absolute ripper though and is a history lesson in its own right. Trieste is part of Italy, but back when the brewery was founded in 1766, Trieste was part of the Hapsburg Empire, which would explain the Austrian flags on the label. The name Theresianer is a nod to the remarkable Maria Theresa of Austria, who was the leader of the Hapsburg Empire at the time and who also had 16 children! Theresianer make a wide variety of beers, including some seasonals. Hopefully we’ll see more of those varieties available. By the way, the food was pretty good at Cala Luna. Good helpings and the calamari was as good as it gets. Now I’ve been posting about my recent trips on Sydney Harbour on the MV Pastime. The skipper, Cap’n Fergus, actually has a day job and doesn’t just drive old trawlers ferrying aspiring beer pornographers around Sydney Harbour. Cap’n Fergus is an architect and won a highly prestigious award during the week. 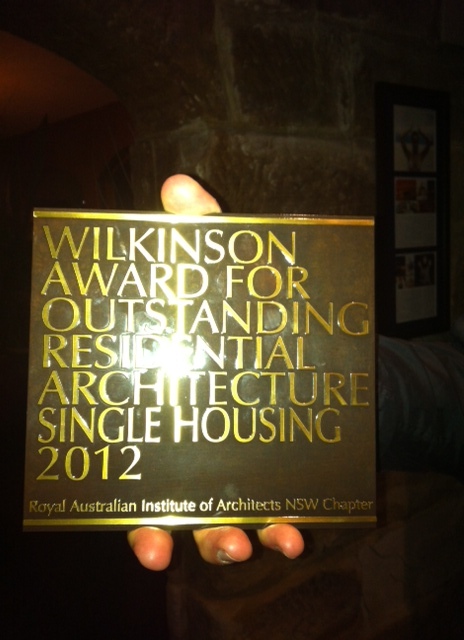 The loftily named Royal Australian Institute of Architects NSW Chapter handed out their annual awards and for the second time Fergus won the Wilkinson Award for residential architecture. This is a very big deal and very difficult to get. The jury’s a tough bunch and in the 50 years the award’s been going there’s been 9 times when nothing cut the mustard. Cap’n Ferg won for the first time in 2003 for Toumball Plains House, which was and still is mindblowing. This year with Peter Stutchbury he has won for a building called Cliff Face House. Here’s a brief taste “With a site bounded by six-metre sandstone cliffs and a road to the East, and running steeply downhill to the Pittwater shoreling, Scott and Stutchbury have employed the rock face as a wall in several rooms…” (SMH 30/6/12 – Trish Croaker). If you think beer hyperbole is OTT, have a read of architecture jury-speak from Camilla Block – “The copper screens create a dynamic yet pragmatic facade and the irregular internal rock face enouraged moments of architectural improvisation in a house whose overall order reveals a deep well of experience”. Well done, Cap’n Ferg – BotF salutes you. Popped in to Aldi at Brookie today and saw the following announcement. 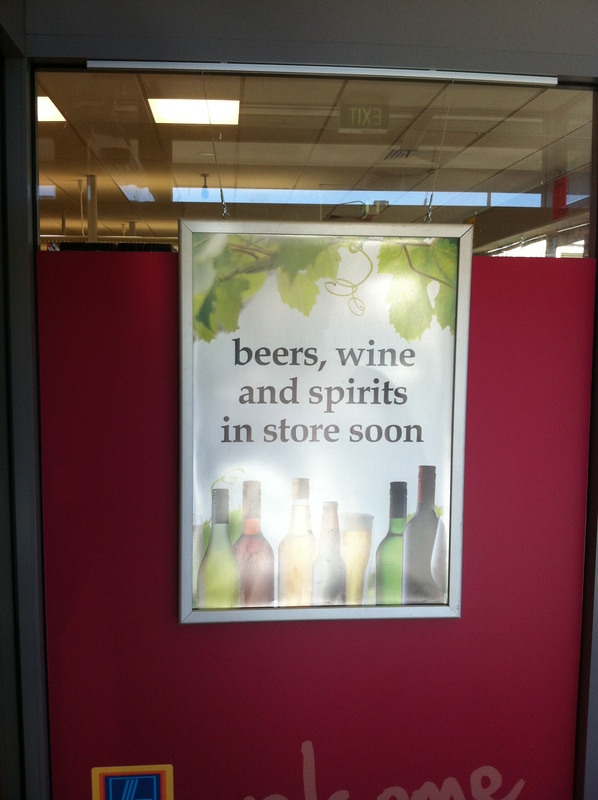 Not sure how Aldi’s gotten around the separate bottlo requirement – but bargain booze will soon reach the Northern Beaches.